Clusters are groups of stitches worked into the same stitch, but rather than an increase, they still only equate to one stitch overall. Our technical editor Charles Voth explains the inner workings of written-out crochet patterns. 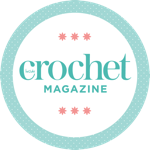 With so many uses for the basic crochet trim, there’s bound to be a perfect project for everyone, so take a look at how to create some of Inside Crochet’s favourite edges and give one or two a go. Following on from last weeks guide to getting started with Hairpin Lace, this week we look at removing the strip from the loom, joining strips, open loops and edgings. Last week we looked at the basic stitches and history of Tunisian Crochet, this week join us as we progress onto other stitches such as Tunisian Simple Stitch (TSS) and Tunisian Knit Stitch (TKS).